When we told people we will be traveling around the world with two young kids for 6+ months, most people could not fathom how we would be able to bring enough stuff with us for such a trip. Many assumed we would need to bring several large suitcases with us in order to hold all our clothes, toys, and other belongings. Our answer to them was that we are just bringing four backpacks, one for each person. Let me start off by saying that I have no intentions to self proclaim myself an expert in traveling with a baby. I have traveled with all 3 of my kids as babies and have some experiences that I love to share with other parents. I like to think that I have generally been pretty lucky and my children mostly behave on flights, road trips, and being in new environments. I say that while remembering, quite vividly I might add, the lollipop my daughter tossed into the beautiful hair of the nice lady sitting in front of us on a trip to Dominican Republic, or when she screamed so much while I was changing her on a flight to Denver that I needed a fresh set of clothes for MYSELF, from all the sweating, and a few more not so fond memories. Anyhow, without further ado here are 5 of my handy tips for traveling with your precious bundle...who may or may not be joyful on his/her very first journeys. Our little guy snoozing away in his Italian crib in Marsala, Sicily. I can't emphasize how important this is. I once a read a book called "Your Survival Skills Are Killing you". It was all about the human brain and how it functions and what it prefers under various circumstances. It talked about how the human brain craves routine and as an example it mentioned that this is why most people get sick right before going on vacation. Even though going on vacation is exciting, it is going to interfere with the routine. At the time I chose to respectfully disagree with that statement, because after all I know that I am not a routine type of gal. I like to be spontaneous and I love change. Fast forward to last year when I attended a talk for parents at a Montessori School and the speaker spoke about the development of babies and toddlers and said many wonderful things but what stood out to me the most was when she said that babies crave routine. Their brain needs a routine and this allows them to be calm and not constantly wonder about what is going to happen next which then allows the brain to focus more on learning and exploring. So what does it mean to set a routine for a baby? The best example would be the eating and sleeping schedule. If your baby has a good routine for sleeping and eating, even if the time zone changes they will adapt quickly. Here is personal example from when we visited Sicily this summer with my then 9 month old. At home, his night time routine was to eat a small amount of solid food, followed by a diaper change, a nursing session, and being put in his crib. When we arrived at the house we were staying at in Marsala, this pretty much remained as his going to bed routine. Albeit, in the middle of the night he woke up sometimes and had to come snuggle with us in our bed, but bedtime routine was always the same. He followed a similar pattern with his 2 naps during the day. Set a routine. I promise you it will be the best thing you ever did. It is way better than overpacking to make sure you have all the things! This is not a secret and many parents use this method already. They book an overnight flight in the hopes that the whole family will get to sleep on the flight or that the car will be quite on that long drive. If it is possible then it is a great option. Especially if the travel time matches with the night time at your destination. Baby will end up getting less hours of sleep but they are quick to adjust themselves, again if you have done a good job taking care of setting that routine for them. Also remember that night time travel is better than travel scheduled around a nap in broad day light. Unless you have a very young one, your baby will most likely want to skip that nap out of excitement and wonder. Eventually though, they all settle down...some sooner than others. Have you heard of the phrase, "permanently exhausted pigeon"? I feel like nothing resonates better with parents. Just because you have a good routine and buy your tickets for when your baby should be sleeping, it does not mean that you have guaranteed yourself a comfortable journey. The goal really is to have a calm and happy baby who is not causing you worry and stress. Everything else is an add on bonus. Truly! Sleep? Oh that 's for the weak! Forget about sleeping...unless you have a magical baby that will sleep 8+ hours in a car seat on his/her own plane seat (which by the way if you do, you are so lucky and I am not sure why you are reading this! ), you will either have to hold your baby on your lap or I even saw some parents wearing their baby which is definitely safer if you happen to doze off but certainly not more comfortable for your posture. Everything in life is about your attitude. Set your expectations right and you will have a much better attitude to handle everything. On our most recent trip, my 9 month old slept pretty much the entire flight to our destination and I even got to watch 1 movie. All fine and dandy except that my right hand fell asleep from the weight of his head on some vein in my arm responsible for taking blood to my hand! How could I complain about a hand that was asleep when I got to watch a movie on the flight though? At least a part of me was sleeping. If you have a good back and your baby enjoys being worn, then think really really hard about taking a stroller with you, especially on flights. Do not take the gigantic American strollers with you to Europe! They are awful. I have first hand experience from taking the City Mini to Paris. Oh mon dieu! This stroller, which is love so dearly for how easily it folds was a nightmare to get in and out of metros. That was all me as a first time mom. What was I thinking? On our most recent trip to Italy, I chose to forget about a stroller all together. My back could handle the weight of my 9 month old and he loved being worn. I had worn him in a wrap since he was a week old. I bought a good baby carrier with decent back support to make sure I had all the help I could get. I remembered that during our trip to Disney World when the baby was 8 weeks old, my back was starting to feel unsupported, especially because we walked a lot. I ended up choosing Lille Baby. I have had a few others and this is definitely my favorite one. It is so easy to use and you can wear the baby in so many different ways. It was the best decision. I had no problems in airports as I could just attach the baby to myself and still use both of my hands. It was so good that we didn't have a stroller to worry about since our car was the tiniest car ever and barely fit our traveling backpacks! We would have had to gotten a bigger car just to fit the stroller! 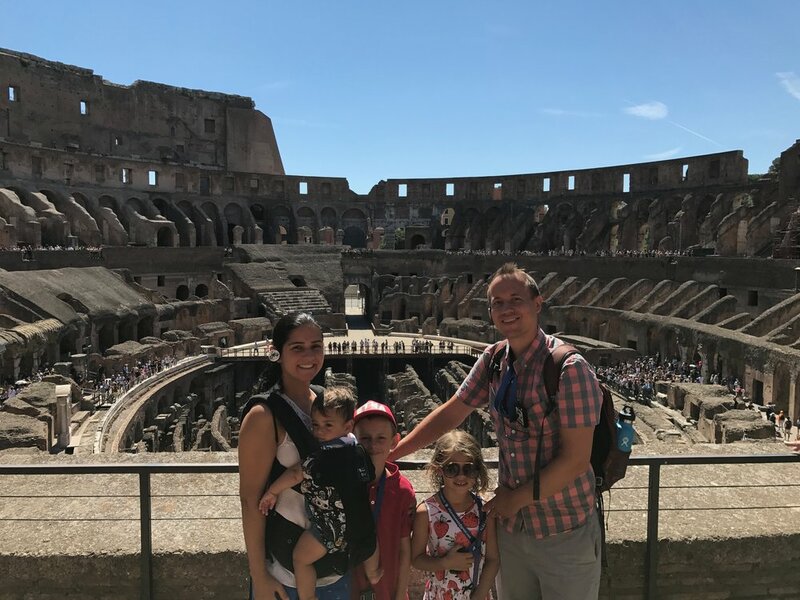 Here I am at the Colosseum with my little nugget tucked in safely and without having to worry about maneuvering a stroller around crowds or dealing with all of those stairs!! "Those who mind don't matter and those who matter don't mind." - Bernard Baruch. Traveling with a baby is hard. Really hard. You should get a gold medal for having the courage to pack your bags and take your tiny bean on an adventure. Kudos to you and your wandering feet. This last tip, I think, maybe especially hard for first time parents who not long ago where on the other side of the line and freely judged those parents in airports, on airplanes, on trains, etc for what they should be doing. We have all been there. I have loved children all my life and always knew I would want to have kids of my own one day but that definitely didn't stop me from judging parents wherever, because I thought I knew better (HA! HA!). Ahem! Reality check was handed to me in 2009, then a second one in 2011, and a third and final one in 2016. So go forth and keep on adventuring with your little one. It maybe hard but all those memories you will be making together are worth everything. Tell me about your travels with your baby. I love to hear your best tips.